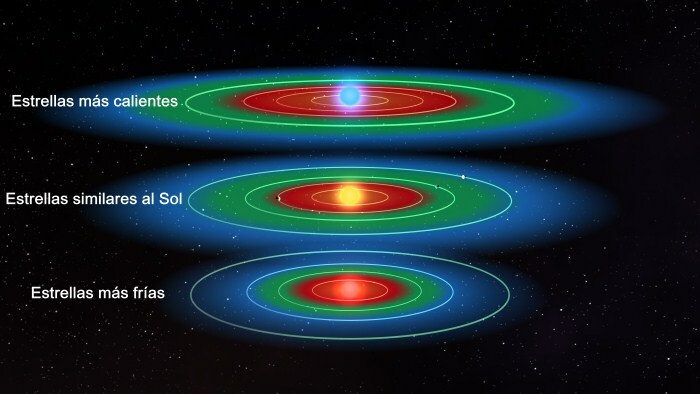 As promised, so today I will talk about the so-called “habitable zone”. The habitable zone or habitable zone is an area around any star where it is assumed that if a planet is located there are high chances that life exists, as we know. Now, as a concept, we can pull the floor and discover a little more, which is not so much physical and if biology or biochemistry. To know why these areas first thing to do is that you need to have life and because these areas are “the best to have it” are chosen. Knowing that is necessary for life involves knowing life is and how they think something that, although it is not known, there are numerous theories about (some Bible that I will not name them either). To start know that is how life and I have to pull some basic physics and quantum mechanics as we need to see the organization of life down. Ie, must be analyzed to know that life is and how they think. If we begin with physics, we know that is an atom and how they bind with other molecules to create different, as we interact and need. In this way we will know which are the basic molecules needed so that these can interact (and therefore know how to interact with them) as they can create more complex compounds (eg things carbon) which can help create these reactions (enzymes) and how are you may be used to multiply (RNA and DNA) to finish on how are you have created increasingly complex compounds forming cells. It is very simple and, knowing that a water and energy means that the first reactions that create molecules of single atoms were created was necessary, in the habitable zone must be in places where water is liquid and can generate compounds as methane, hydrides, acids, bases, ions, etc … so that planets can have and maintain atmosphere and elements similar to Earth in those days. For, from this base, waiting to make every chup chup and exit life. Knowing this we can put inside a star and by electromagnetic energy emitting an area where something can be positioned to receive enough energy to make atoms and molecules become more complex to catalyze these compounds. That, as I said, depends on the star itself and type of radiation emitted. And if I said radiation since the creation of compounds needs energy and can be obtained from “any kind”. There will need to be considered in the habitable zone, which is the most likely area for these conditions are maintained and, above all, what kind of planet would be necessary in order to have optimal conditions. That is, if to catalyze certain reactions takes an average of 30 degrees and the creation process, not a carboxyl group, you need these 30 degrees is maintained for 5 consecutive days for the activation energy of the compound, it will be necessary that the planet rotates at a certain speed by size for the compound to receive enough power (no more, no less). And obviously, the planet must contain the necessary material to make it happen … the planet or surroundings or somehow it gets the necessary materials for it. This makes the habitable zone grow, reduce or simply mute exist or not. Come on, that the habitable zone depends not only on the star but the set in if the system studied because, for example, in the solar system, the habitable zone extends from Venus to Mars and, as we know, in those two planets “there is no life”. Obviously it has its characteristics, such as different areas or radios from where it starts to where it ends, I think it is called internal and external radio or something. And it is a multiplier that is added to the equation I indicates how possible that there’s something there. It is a very interesting and fun theme that affects many branches of science, so let’s look it. You can read the spanish versión of this here.